Probably the most famous and accomplished scientist of all time, Albert Einstein was the son of a featherbed salesman and his amateur violinist wife, and got poor marks in grade school. As a child he spoke rarely and haltingly, and some biographers have suggested that he was mildly autistic, while others hold that he was simply shy or bored by ordinary conversation. As an adult he remembered an uncle's gift of a compass when he was about five years old as igniting his imagination and curiosity. He dropped out of his first high school, chaffing at the headmaster's militaristic style, and obtained his diploma at a different school, but only because it was required to obtain college admission. He earned his doctorate while working as a patent clerk, and unable to find adequate income from academic work he continued working at the patent office even as he was writing papers that altered humanity's understanding of the basics of time, space, and science. In 1905 Einstein, still a patent clerk and effectively a rookie scientist, wrote five scientific papers, including his most famous work, "Does the Inertia of a Body Depend upon its Energy Content?". This is the paper which concluded that any increase in energy (E) causes a corresponding increase in mass (m), and that these increases are related by the speed of light in a vacuum (c) squared — E=mc². In another paper written the same year, initially derided (and later accepted) by Max Planck, he proposed that electromagnetic radiation must consist of quantums or photons, which became a cornerstone concept of quantum theory and earned Einstein the Nobel Prize in Physics in 1921. In 1911 he was the youngest physicist present at the Solvay Conference in Brussels, the first modern meeting of physicists, and by the end of the decade he was the world's most famous scientist. Einstein's theories of general relativity and special relativity were questioned and argued among physicists for years, and remain largely beyond the ken of ordinary people a century later. When astrophysicist Arthur Eddington was asked by a reporter whether it was true that only three people in the world truly understood relativity, he took a long breath before replying, "I am trying to think who the third person is". In 1929 Einstein and Planck were co-recipients of the German Physical Society's first Max Planck Medal. A long-time pacifist, Einstein gambled his career by signing an anti-war petition at the height of World War I. He signed a manifesto against compulsory military service in 1925, and renounced his German citizenship — twice — first in 1896 to avoid military service, and again in 1932 to avoid the Holocaust as he came to America. In 1939 he wrote his famous letter to President Franklin D. Roosevelt advising the development of atomic weapons, since he was sure the Germans were working toward that goal. He was a member of the NAACP, and an active participant in his friend Paul Robeson's American Crusade Against Lynching. Of course, Einstein had a thick FBI file and J. Edgar Hoover suspected that he was a communist. In 1946 he wrote a public letter advocating the establishment of world government, and in 1952 he was offered the Presidency of Israel, but declined. In the last months of his life he wrote another public letter, co-authored with Bertrand Russell, pleading for a concerted effort against the growing threat of nuclear war. He was also a skilled violinist. His private life was somewhat less immaculate. He fathered at least one child out of wedlock, then married the child's mother, but their daughter was either given up for adoption or died in infancy. During an extended period of ill health from about 1917-20, as he dealt with recurring bouts of jaundice, liver illness, and general weakness, he was nursed by a cousin who became his mistress and, after his first marriage ended in divorce, his second wife. Einstein's numerous affairs had infuriated his first wife, but the second Mrs Einstein was more permissive. His diaries, published in 1999, reveal that Einstein seriously considered abandoning his mistress and wife-to-be in favor of her 20-year-old daughter Ilse, who became his stepdaughter instead. In addition to the missing daughter with his first wife he had two sons, of which one became an engineer, as the other was institutionalized with schizophrenia. 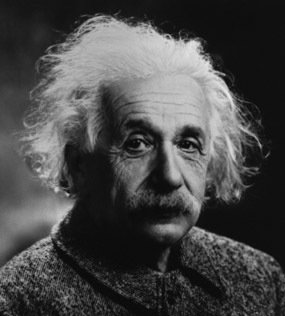 Einstein's other notable accomplishments include development of Bose-Einstein statistics, studies of Brownian motion, and his long work on a Unified Field Theory. The latter took more and more of his time beginning in the 1920s, and by the early 1930s he was somewhat isolated from the forefront of physics. In 1928 he was diagnosed with an enlargement of the heart, and in 1955 he was hospitalized with an aortic aneurysm, which claimed his life on 18 April 1955. Concerned that his tomb would attract gawkers and grave-robbers, Einstein left instructions that his corpse be cremated and the ashes scattered in a secret location, now believed to be the grounds of the Institute for Advanced Study and the nearby Delaware River. His brain was removed for "research", however, before his corpse was cremated. Sliced and pickled, it has been examined by researchers, revealing that his brain's inferior parietal lobe, where mathematical thought and spatial imagery are centered, was a bit larger than normal. Often used the word "God" or "Old Man" as a metaphor for the Laws of Nature. As a member of the American Humanist Association, there is little reason to think he believed in any kind of personal God. In a letter to Eric Gutkind dated 3 January 1954 he wrote, "The word god is for me nothing more than the expression and product of human weakness, the Bible a collection of honourable, but still primitive legends which are nevertheless pretty childish... For me the Jewish religion like all others is an incarnation of the most childish superstitions. And the Jewish people to whom I gladly belong and with whose mentality I have a deep affinity have no different quality for me than all other people. As far as my experience goes, they are also no better than other human groups, although they are protected from the worst cancers by a lack of power. Otherwise I cannot see anything chosen about them." An earlier letter to M. Berkowitz, dated 25 October 1950, uses hedged words to indicate sympathy towards agnosticism but Einstein pointedly refrains from calling himself agnostic: "My position concerning God is that of an agnostic. I am convinced that a vivid consciousness of the primary importance of moral principles for the betterment and ennoblement of life does not need the idea of a law-giver, especially a law-giver who works on the basis of reward and punishment." Certainly with this view one cannot call him a Deist as some claim. The careful choice of words thus permits his atheistic view three years later. Einstein publicly claimed on several occasions that he was not an atheist, but it is difficult to square that with the private declarations to Gutkind.